Wireless technology is rapidly replacing the regular wired connections today especially in local home networks. People mostly prefer their devices to be wireless for mobility and to avoid using unsightly cables. To make this possible, you need devices such as wireless routers, access points, network adapters, wireless bridges and media connectors that allow wireless connectivity. Routers and access points mainly serve as the source of our wireless connection while the network adapters, wireless bridges and media connectors act as receivers. The Linksys Wireless-AC Wi-Fi 5GHz Universal Media Connector Bridge with 4-Port Switch (WUMC710) is a four-port single-band wireless Ethernet bridge that allows you to connect your Ethernet-enabled devices such as gaming consoles or DVRs to your wireless network. This media connector is based on wireless-AC so it is compatible with wireless-N (5 GHz) and wireless-A routers and access points. However, it is advisable to connect the media connector to a wireless-AC router for optimum wireless network performance. These are optimized for streaming video and ideal for wirelessly streaming or sharing music, photos, movies, and other files around the home. How to use your media connector? 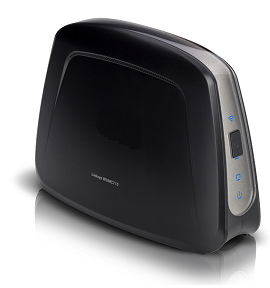 The Linksys WUMC710 serves as a switch that you connect wirelessly to your home router. It allows you to expand your existing network by providing more Ethernet ports to allow you to connect more devices to your 5 GHz network wirelessly. After synchronizing the wireless settings of the media connector and the router, you can now connect different wired devices to it. The media connector converts any wired network enabled device with available Ethernet port to the latest wireless technology. Now you can make wired devices such as printers, wired computers, TVs, Blu-ray players, game consoles and even network attached storage wireless.